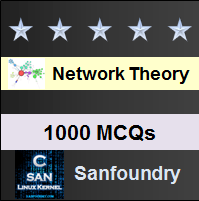 This set of Network Theory Multiple Choice Questions & Answers (MCQs) focuses on “Average Power”. 1. The equation of the average power (Pavg) is? Explanation: To find the average value of any power function we have to take a particular time interval from t1 to t2, by integrating the function we get the average power. The equation of the average power (Pavg) is Pavg = (VmIm/2)cosθ. 2. Average power (Pavg) =? 3. In case of purely resistive circuit, the average power is? Explanation: In case of purely resistive circuit, the phase angle between the voltage and current is zero that is θ=0⁰. Hence the average power = VmIm/2. Explanation: In case of purely capacitive circuit, the phase angle between the voltage and current is zero that is θ=90⁰. Hence the average power = 0. Explanation: In case of purely inductive circuit, the phase angle between the voltage and current is zero that is θ=90⁰. Hence the average power = 0. Explanation: If a circuit has complex impedance, the average power is power dissipated in resistor only and is not stored in capacitor or inductor. 7. A voltage v (t) = 100sinωt is applied to a circuit. The current flowing through the circuit is i(t) = 15sin( ωt-30⁰). Find the effective value of voltage. Explanation: The expression of effective value of voltage is Veff = Vm/√2. Given Vm = 100. On substituting the value in the equation we get effective value of voltage = 100/√2 = 71V. 8. Find the effective value of current in the question 7. Explanation: The expression of effective value of current is Ieff = Im/√2. Given Im = 15. On substituting the value in the equation we get effective value of current = 15/√2=11V. 9. Determine the average power delivered to the circuit. Explanation: The expression of average power delivered to the circuit is Pavg = VeffIeffcosθ, θ = 30⁰. We have Veff = 71, Ieff = 11. So the average power delivered to the circuit Pavg = 71 x 11 x cos 30⁰ = 650W. 10. Determine the average power delivered to the circuit consisting of an impedance Z = 5+j8 when the current flowing through the circuit is I = 5∠30⁰. Explanation: The expression of the average power delivered to the circuit is Pavg = Im2 R/2. Given Im = 5, R = 5.So the average power delivered to the circuit = 52×5/2 = 62.5W.